Crewe changed their grounds name to The Alexandra Stadium in 2000, however it is still better known as Gretsy Road by the wider football fraternity. It has been Crewes home ground since 1906 and the picture below shows it as it was prior to redevelopment, this was taken from a Football Review magazine in the early 70's. 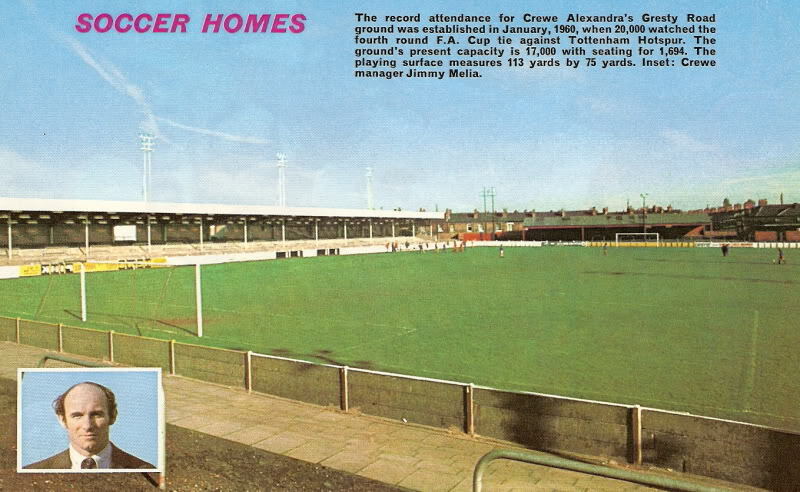 "The record attendance for Crewe Alexandras Gretsy Road ground was established in January 1960, when 20,000 watched the fourth round FA Cup tie against Tottenham Hotspur. The grounds present capacity is 17,000 with seating for 1,694. The playing surface measures 113 yards by 75 yards. Inset: Crewe manager Jimmy Melia." I have also found an absolutely stunning piece of old film footage below that shows the old Gretsy Road ground as it used to be in the 1970s.